We left the hailstones of AYME TRUFFE behind, this morning a lot clearer, brighter and drier than the previous afternoon had been. 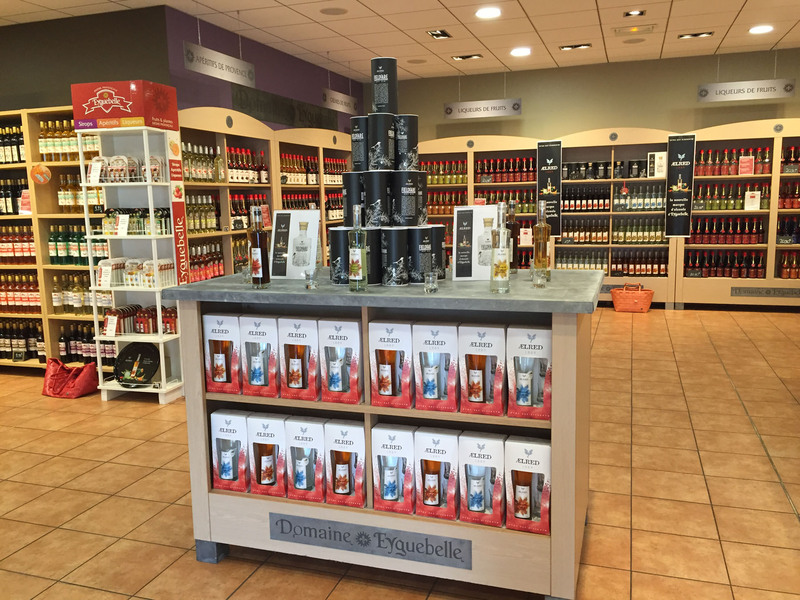 We first stopped at a well-known local liquor distiller outlet, Domaine Eyguebelle, where we had a quick tour of their museum and facilities and a few indulgent tastings of their wide range of products, although we left without purchasing anything on this occasion. Again, we didn’t move far, as this area of France was rich with options and opportunities and we had a few extra days to enjoy before our skiing date. We drove only a handful of miles back west, to the village of Saint-Paul-Trois-Chateaux, where we treated ourselves to a couple of nights in a comfortable, off-season and almost empty campsite, as a little treat and to ensure we had access to Wi-Fi and a TV, as this was the opening weekend of the Six Nations and we’re big rugby fans. We arrived and set up our pitch after greeting the lovely, amiable hosts who generously and selflessly offered us access to their currently closed-for-refurbishment bar area. 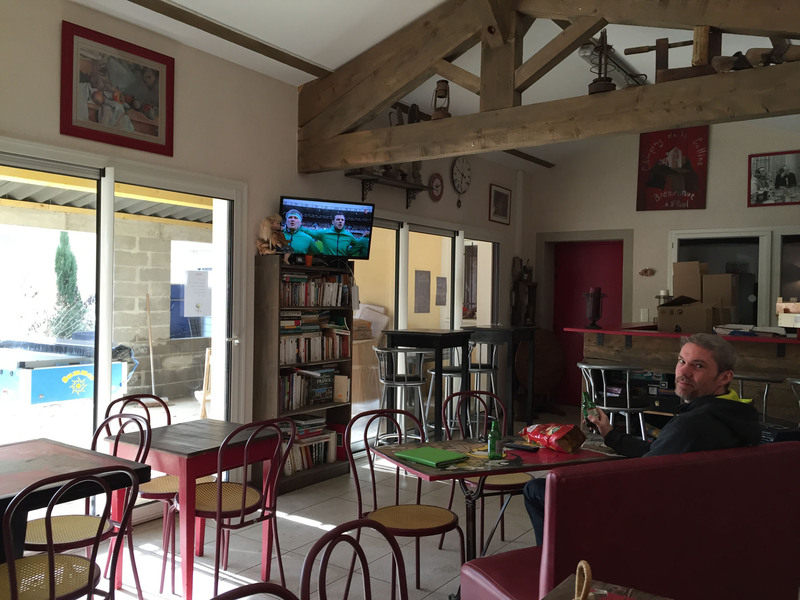 Rather than having to rely on watching France 2 on-line over a dodgy Wi-Fi connection, we could now watch the matches in our own private bar space; perfect. Nicky had a friendly and jolly conversation each time our host passed by, and decided that she should have the coveted title of Nicky’s adopted French mummy; she was so sweet and helpful and lovely and made our stay much more comfortable and enjoyable. On Sunday morning, in a light drizzle, we wandered into the nearby village of Saint-Paul-Trois-Chateaux. 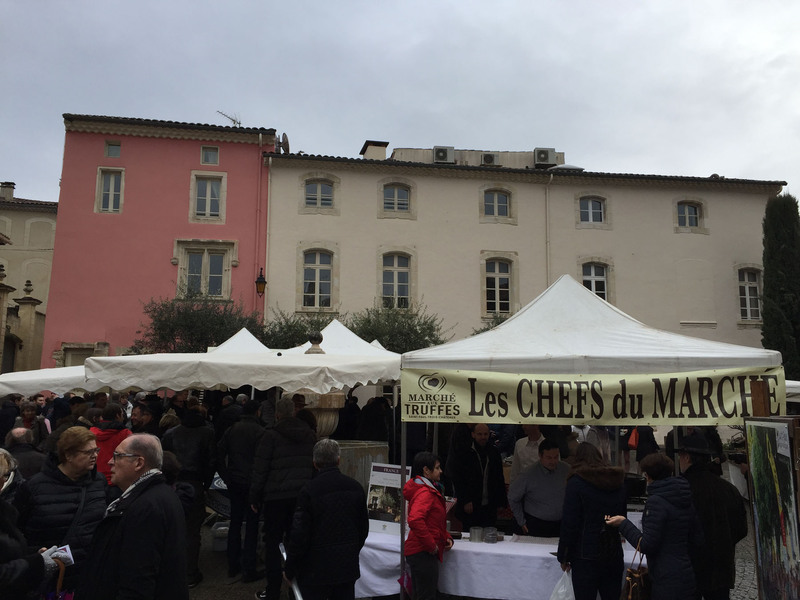 We discovered some very beautiful streets and squares, one of which had a well-hidden but lively truffle market in full swing. We joined in and treated ourselves to some warming truffle ravioli and a glass of red, not quite our usual Sunday morning brunch, but it was very tasty and a thoroughly French experience. We later carried a fresh, warm baguette home under our arm to continue our strict observations of local customs. After leaving Camping de la Colline we first headed north and visited the large town of Montélimar. We parked up in a central aire that usually carries a small charge, but the ticket machine was out of action, so we enjoyed free parking close within a town centre, instead of having to drive our usual frustrating loops in search of a suitable spot. 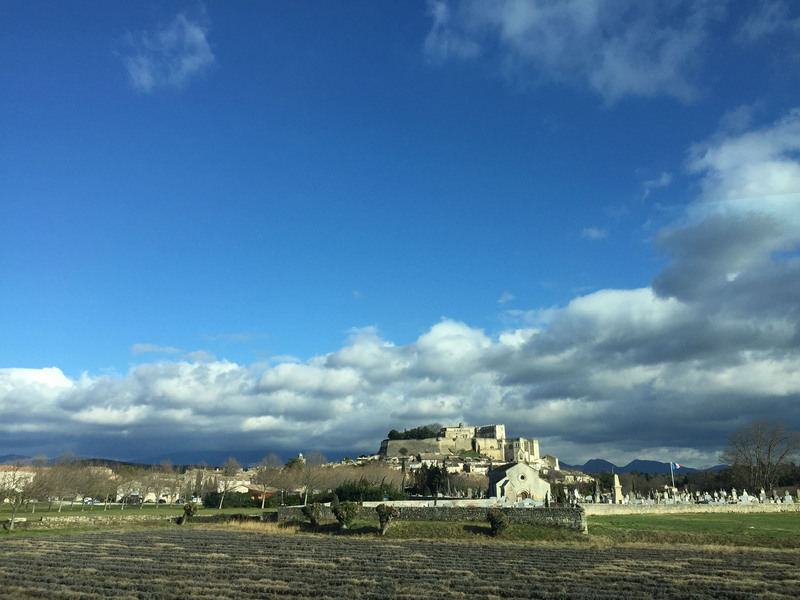 We walked the short distance to the Tourist Office, then through the rather dead town centre in search of the famous local delicacy – Montélimar nougat. There were many shops selling the confectionary, and we were offered a few free samples in various stores, but it was certainly not the same product we remembered from our childhood; it had a weird, dry texture, rather unpleasant, like eating nutty cotton wool. We quickly visited a local Feu Vert, a French Halfords equivalent, to purchase snow chains and a shovel in readiness of us ascending to 1500m in a few days’ time. Although the weather suggested we’d not need them, for the sake of safety and our own peace of mind, and to alleviate the possibility of the local gendarme, who can on occasion check whether vehicles have the correct equipment for the conditions, stipulating that we cannot proceed into the high mountains without them. They will always be a useful carry for future ski trips, or potentially for our upcoming Norway adventure. We left Montélimar and headed eastwards to begin our push back towards the Alps. 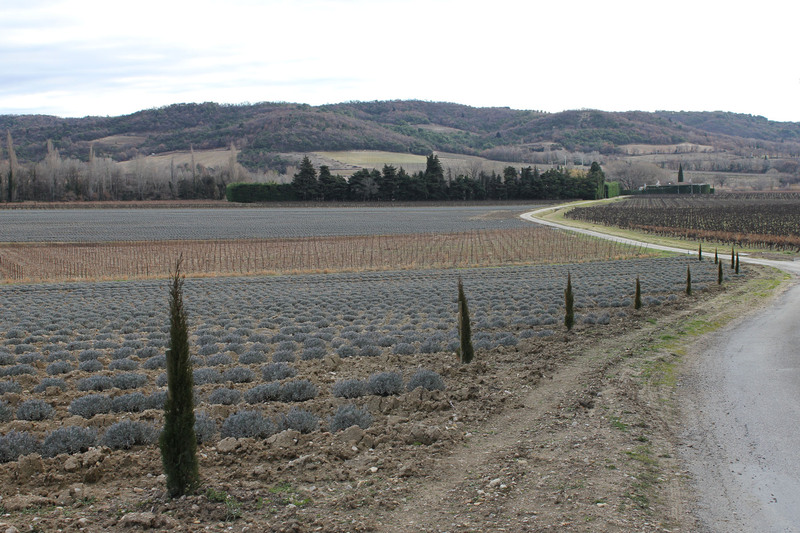 We ended up back in prime vineyard territory, and after several false stops and changed minds, we settled on a large, well set up aire at the Domaine des Lauribert, with space for perhaps thirty motorhomes but with no other current visitors. 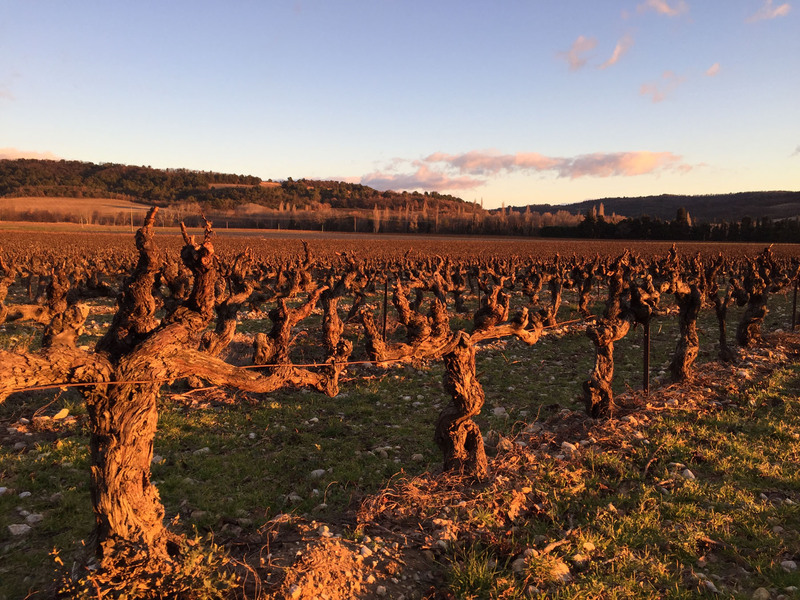 The freezing cold Mistral winds were blowing a chill through the site, but it was a beautiful sight as the sun dropped its pink light over the bare vines in the vineyards right by our private, quiet spot. 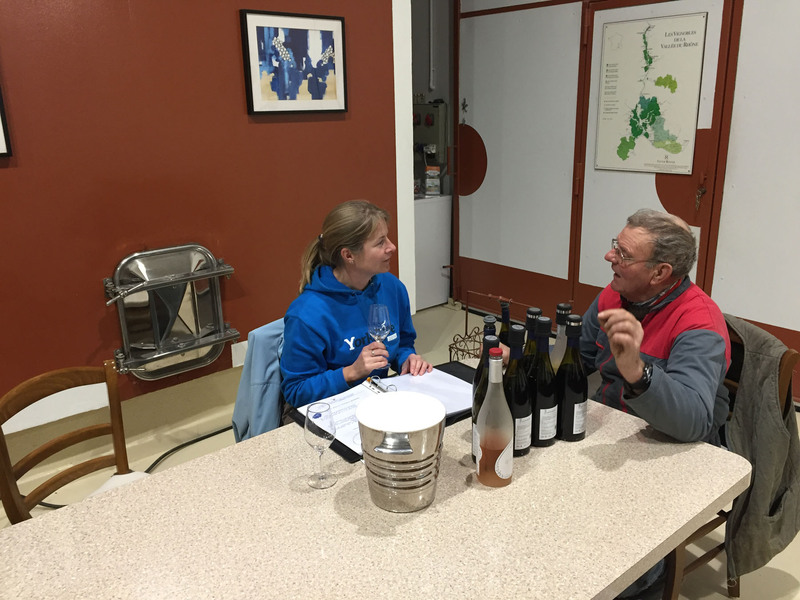 We had a late wine tasting with the owner Robert, whose name was responsible for the -bert of the Domaine’s brand name. We tried six or seven different varieties of their wines, from rosé to white to fruity reds, to the deep oak aged reds that were so strong and almost overpowering. Robert also insisted we try a few other available products from their produits de terroir, such as local honey with lavender. We purchased a couple of bottles, a fresh, clean white and a fruity mid-red we both enjoyed. Nicky was also kindly given the already opened but still almost full bottle of white used for our dégustation for further private tastings ‘pour la nuit’. This gift earned a big merci and three neat kisses on cheeks. The following morning we were out of basic provisions, namely bread and tea bags, so as the weather was dry and bright and the wind had died down, I decided to run to the nearest shop whilst Nicky played with her camera in amongst the vines. 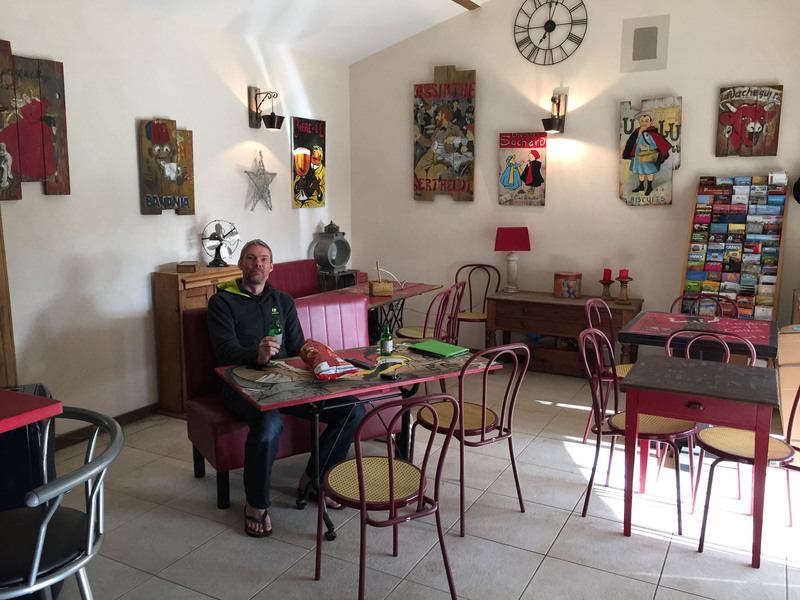 It was a beautiful 4km run through rolling vineyards and farmland to the outskirts of the nearest town where I found a suitable shop and bought the necessary items, although I had to work a little harder returning uphill to the Domaine. We later had a long walk out into the countryside, to enjoy the air and views. 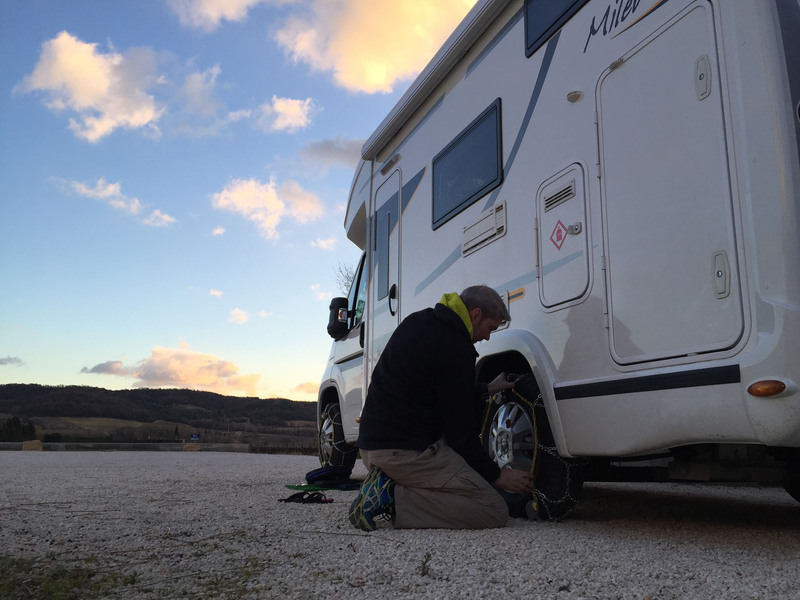 We then practiced putting on our snow chains, to be prepared should we need to jump into action on the steep climbs up to Serre Chevalier, although we were hopeful our efforts would be entirely wasted and unnecessary. The next morning we continued our drive up the valley in the direction of Gap, stopping at a scruffy car-park and walking around the village of La Roche-Des-Arnauds. From here we continued up the valley, the roads thankfully clear of snow and cars, to reach the bottom of the Serre Chevalier valley, at the large town of Briançon. We parked in another free aire overnight, a shared car-park really, and had a very steep walk up to and around the old town streets. 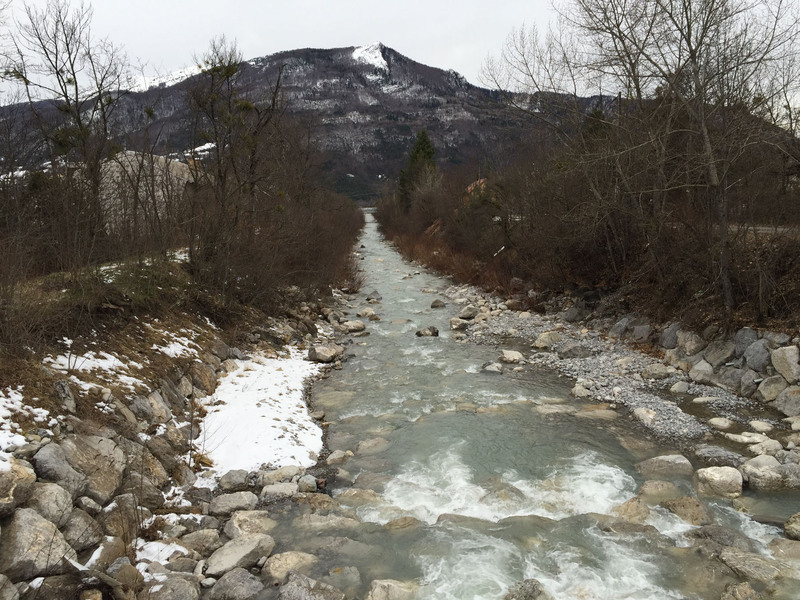 The following morning we had only a short trip of seven miles to our base for the week, a private aire in the central village of Villeneuve. It was here we were meeting friends from the UK for a week’s skiing. We settled in and readied ourselves for a very active ski week. 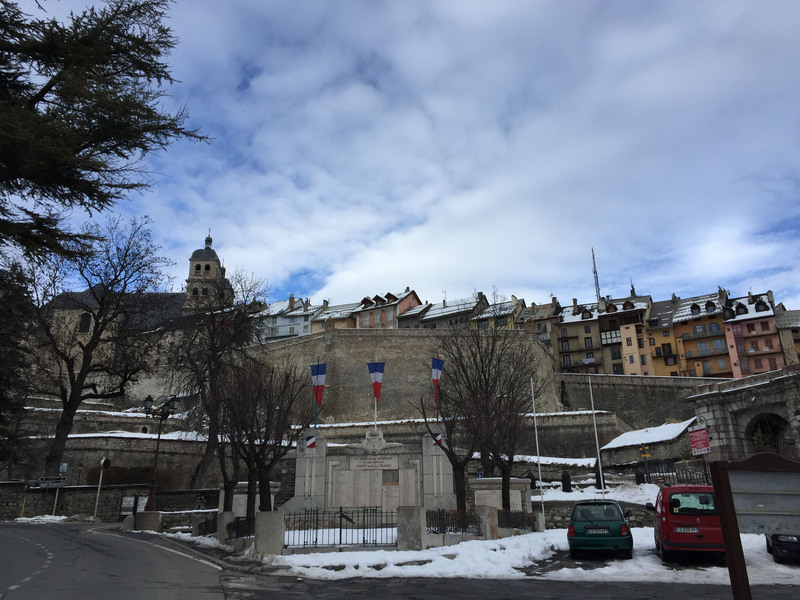 This entry was posted in France, In France, Our Travel Journal on Feb 24, 2017 by Aaron Hill.